There is still a lot to learn about how climate change will affect the world. Jonathan Kingslake, assistant professor in the department of earth and environmental sciences at Columbia University, explores how meltwater may affect the Antarctic Ice sheet and sea level rise. After two years of working and backpacking I went to The University of York, UK, to study undergraduate physics. My final year project was on the nucleation of freezing in supercooled water, supervised by Dr Richard Keesing. We scattered a laser through droplets of supercooled water to observed freezing as it was initiated by the application of an electric field. In 2009 I was awarded a University Scholarship and started a PhD in glaciology in the Department of Geography at Sheffield University, supervised by Dr Felix Ng. I wrote a thesis entitled ‘Modeling ice-dammed lake drainage’ (pdf). I used mathematical models to study how water flows beneath glacier (see research section). 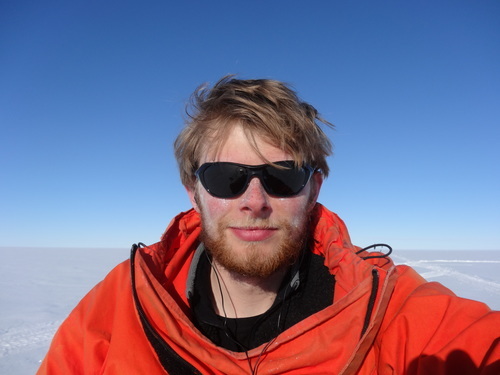 In 2013 I started as a Glacier Geophysicist at the British Antarctic Survey (BAS), Cambridge, UK. I was employed on a NERC-funded project led by Richard Hindmarsh. We used radar and mathematical models to study present-day and past ice flow in West Antarctica. In March 2016 my wife and I moved from the UK to start my current position as Assistant Professor in the Department of Earth and Environmental Sciences, Columbia University, and the Lamont-Doherty Earth Observatory. I am continuing my research in Glaciology and teaching undergraduate and graduate students. I collaborate with members of the Polar Geophysics Group here at Lamont, and colleagues from Sheffield (e.g. J. Ely, S. Livingstone), BAS (e.g. A. Brisbourne, C. Martín) and elsewhere. Predicting how the world’s ice sheets will behave in a warming world may help us defend coastal communities against sea-level rise. But the behavior of the ice sheets is really hard to predict because, to put it bluntly, they are very big and very complicated! Recently, my colleagues and I started looking at satellite images and old aerial photographs of the Antarctic ice sheet, and what we discovered surprised us. During summer, in many places, water drains long distances across the ice surface through intricate networks of streams, and feeds vast lakes. Some of these features have been there for decades, but no one had cataloged them. We never expected to see so much meltwater. One lake – twice the size of Manhattan – fills in a few weeks during summer then freezes over again in winter. It has been doing this regularly since at least 1973. In another location, a large river drains off the front of the ice directly into the sea in a stunning waterfall. These observations aren’t just startling and beautiful. They also raise some serious questions. In the warmest parts of Antarctica, meltwater lakes are thought to have triggered the collapse of floating portions of the ice sheet, so called ice shelves. This causes ice upstream to flow more quickly into the sea and speeds up sea-level rise. So, if the atmosphere warms and melting increases, as is predicted, will these streams deliver more water to vulnerable parts of ice shelves and accelerate collapse? Or will the water flow directly into the ocean? Different scenarios could mean different rates of sea-level rise. Currently, we are a long way from being able to answer this question and many other important ones. But the glaciology community is working on it!